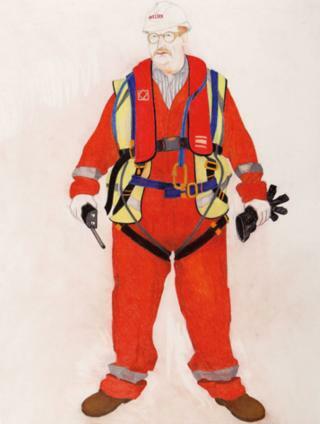 Artist Sue Jane Taylor's interest in the oil industry has seen her spend time on remote offshore platforms, documenting the "human side" of the people who work offshore on these incredible, "brutal" installations in the vast waters of the North Sea. 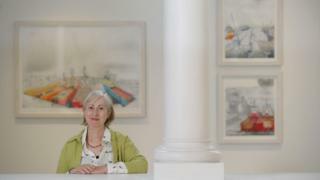 For Taylor, whose work will feature in a new exhibition at the National Museum of Scotland, the oil industry has been a constant presence in her life. "The industry was part of my blood because I was born and brought up on the Black Isle and as a young child I witnessed the oil boom hitting the north and changing, in front of me, the whole area," the Highland artist says. "It brought a resurgence in population mostly due to the Nigg and Ardersier fabrication yards starting up and employing, at that time, more than 5,000 people in each yard. "So all around me it was there as a child and then as an art student in Aberdeen I witnessed the oil boom there in the late 1970s and early 80s." Her artistic interest in the industry came to the fore when she was commissioned to go out on a cargo vessel and got to see an oil rig up close. "Seeing a platform from sea level in the middle of the night, this giant steel monster with huge lights on was terrifying but exciting at the same time," says Taylor. "As an artist it was extremely exciting visually to try to interpret, but also it was a world so separate from our own worlds onshore and not so many people knew about it. "I was very interested in the people who worked there in these extreme environments." It is this interest in the human side of the industry that has always been close to her heart. During another early trip offshore she spent time on the Piper Alpha platform about a year before it was destroyed in an explosion, with the loss of 167 lives. She later went on to design a memorial to the victims in Aberdeen's Hazlehead Park. Even though the memorial stands as a reminder of the tragedy, she believes there is still too little wider understanding of the lives of the thousands of people who work offshore. "I always compare it to the shipyards on the Clyde which are remembered with nostalgia," says Taylor. "Because offshore work is so out of sight, out of mind and remote, people can't relate to it in a way. But it is so important economically in our lives and 98% of everything we do relates to oil. "It also has its dark side and I feel it is very important as an artist to understand this industry. It is a very corporate world, a very secret and controlling world and for any outsider to try to enter that world is very difficult. "Most of the industry is depicted in photography and film and that is important but there is so much more to be told than the cold hard incredible technological feats and machines. "There is a human side to it as well." The artist adds: "Artists always look at things differently and for me it is really about the people and the incredible environmental setting. "What I have tried to do is show the scale of these installations. They are huge functional beasts. They are not bonnie. They are very brutal in many respects. and there is an amazing contrast with where they are out in the natural vast northern seas. "It really is extraordinary to be there and just experience that. And also I am interested in the work gear these people wear in particular the survival suits they have to wear to go out on the helicopters. "I love all those bright colours." Getting out offshore has not always been easy for Taylor. 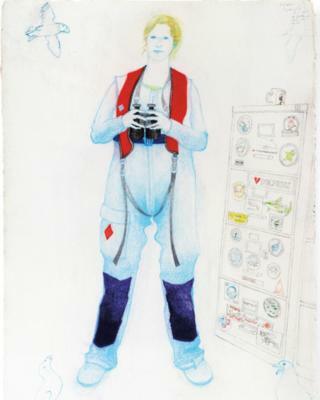 She has had all the survival training such as being dunked upside-down underwater in the helicopter simulator and at times she has had to overcome scepticism within oil companies about letting an artist hang out and document their activities. "Convincing oil companies, people onshore in the office, that you are serious about what you are doing and that it is important historically is not easy," says Taylor. "It is not in their way of thinking to have an artist out there but I have been very lucky. "There are some gems in the industry who have a vision and see that my role has been important. I was on the Murchison Field three times witnessing the last months and production and the shutting down ceremony. "I was with the last 18 crew before abandonment of the platform. I was very lucky and it was really the guys offshore who got me that because they realised that not a lot of people understand the work they do offshore." Things are changing off Scotland's east coast where a new industry, offshore renewable energy, is being born and she has found it fascinating seeing the early stages. Taylor says: "One of the commissions which Talisman energy invited me to record was the Beatrice offshore deep water wind turbine project back in 2006. "It was just fantastic following that whole pilot scheme which was really a precursor for the massive Beatrice offshore wind farm being built now out in the Moray Firth. "Basically they are using oil and gas technology and translating it into renewable energy offshore wind. "I was also up in Orkney documenting some of the experimental renewable energy devices being tested there. "I was drawing a couple of the tidal and wave machines which look more like pop art installations or strange surreal sea creatures." "There is a tradition in Scotland and the UK of industrial art and it is very much our contemporary landscape. And for me the Highlands is not just hills and heather and vast beautiful iconic natural world there are also other things going on there and I think it is important for an artist to portray that." Age of Oil is running at the National Museum of Scotland in Edinburgh until 5 November and will be exhibited at Aberdeen University's Sir Duncan Rice Library next year.